Saudi Arabia's interior minister has dismissed the accusations. According to the official Saudi Press Agency, Prince Abdulaziz bin Saud bin Naif bin Abdulaziz said "orders to kill him are lies and baseless allegations". Saudi Arabia has maintained the journalist left the building, with the minister saying the kingdom was keen to discover "the whole truth", according to the news agency. Mr Khashoggi's disappearance and reported death have prompted international outrage and dented business confidence in Saudi Arabia. Tycoon Sir Richard Branson has halted talks over $1bn Saudi investment in Virgin space firms and several top business leaders and media groups have pulled out of a Saudi investment conference later this month. However, US Treasury Secretary Steven Mnuchin told American news network CNBC he was still planning to attend the conference, despite the House of Representatives' foreign affairs committee writing to President Donald Trump urging him to reconsider. "You can hear his voice and the voices of the men speaking Arabic," a separate source told the Post. "You can hear how he was interrogated, tortured and then murdered". Mr Khashoggi is a contributing columnist for the newspaper. A 15-strong team has been identified by Turkish media who are described as involved in Mr Khashoggi's disappearance. The BBC has been told that one was Maher Mutreb, an intelligence colonel based in London, and another was thought to be a forensics specialist. 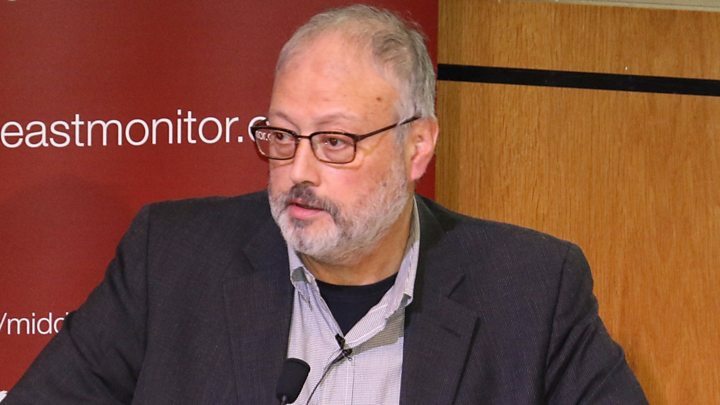 Turkey's official line is that Mr Khashoggi is missing but that it knows "for sure" he has been killed. Mr Khashoggi's disappearance threatens the reputation of the new Saudi Crown Prince, Mohamed bin Salman, and his country's relationships across the world, the BBC's Turkey correspondent Mark Lowen reports. Jamal Khashoggi's disappearance and alleged murder has sent a chill through writers and activists, in Saudi Arabia and more broadly across the Middle East. He argued for reform rather than regime change - which is a very widespread stance among Saudis. There are many people there who seek a greater voice in how to improve their society without being enemies of the state.